As a creative entrepreneur, you may have noticed a few shifts in business lately; one of the most notable changes is that potential clients are no longer searching for the “best product at the best price” and running off into the sunset with their shiny new item. They are looking for more than just a quick transaction. Customers are looking for an out of this world experience that they can buy into—a story if you will. Our society is very “go, go, go,” but luckily customers are beginning to search for genuine connections that they can relate to before making a purchase. They don’t want to be viewed as just another transaction, they want to buy into something more. Well that’s great, grand and wonderful, Lauren, but I hardly have time to shower, let alone dote on every single client. That my friend, is where you are wrong! Say hello to your saving grace, the Welcome Guide. A welcome guide positions you as the rockstar that you are and shows customers that you have your ducks in a row (even if you are actually paddling at lightning speed under the surface). The main problem I have seen come up for my own clients is that although you may have started handing out welcome guides to clients like orange tic-tacs (arguably the best flavor in the history of ever), that informational little gem of yours is actually a turnoff. 1. Too much info otherwise known as FOMO. If your welcome guide resembles a college textbook, chances are you need to do some adjusting! I don’t know about you, but I am terrible about keeping up with the new acronyms that are always being thrown into pop culture. FOMO is the only exception to my “I don’t have room in my brain to learn a new abbreviation” rule. FOMO[FO-MO] | noun1. anxiety that you are missing out on something incredible whether it be profound information and/or the secret to life, often aroused by posts seen on a social media or websites. I can almost guarantee this phenomenon has trickled down into your life/business in one way or another. In fear of not providing your client with all the imperative details they may ever need while working with you, you take it to the other extreme and give your client with sensory overload. 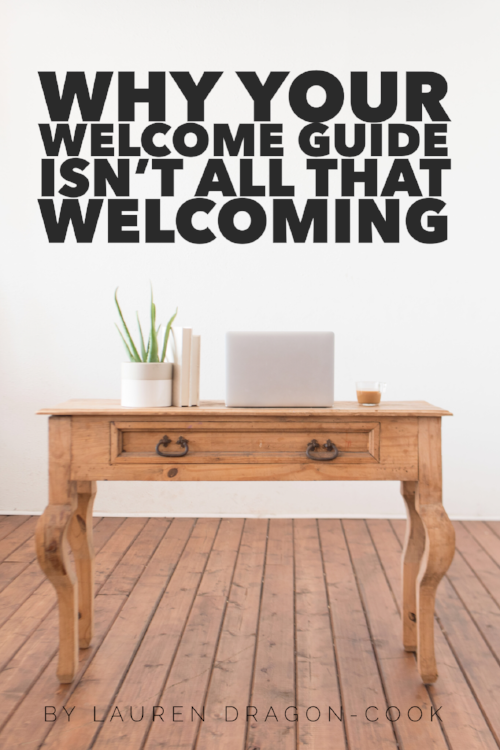 Don’t talk about #allthethings when it comes to welcome guides. Keeping things simple and only including the absolute essentials will keep your reader engaged and excited. Nobody enjoyed reading 5” thick college textbooks, why in the world would your client want to? 2. Talks too much about you. If your welcome guide covers info like the time you were born and the year you graduated high school, chances are you need to do some adjusting! Just like your about page on your website, the welcome guide should have NOTHING to do with you. Your guide is serving the sole purpose of answering all the questions and solving the problems that your clients typically have. How are YOU going to be able to help them during your time working together? Your people already know you and have fallen in love with your story, that is why the hired you, right?! The welcome guide is not the time or place to be dishing about how you didn’t give your pacifier up until you were 6. In fact, I don’t know where you would even want to divulge that info. Best to keep that one to yourself. 3. Leaves client still questioning what to do next. If your welcome guide leaves your clients more clueless than before they read it, chances are you need to do some adjusting! If you have a website, chances are you have heard of a CTA or Call To Action. You should think of CTAs as road cones in guiding your clients exactly where you want them to go. If you miss the opportunity to wrap up your welcome guide with a final call to action, then you are doing yourself a disservice because then you will have to continue to answer the same slew of questions from each client that sound similar to, “Now what do I do?” GUIDE them to the next step in the process of working with you. You have their full attention, use it to your advantage! 4. Took too long to receive. If your welcome guide doesn’t make it to your client before you finish their project, chances are you need to do some adjusting! Don’t get me wrong, I’ll be the first to admit I’ve been guilty of this in the past myself. The key here is creating a system that never changes when a client hires you. It can be as simple as: client signs the contract, then pays a deposit, then you send the welcome guide. Done. Easy peasy. It is when you are flying by the seat of your pants and haven’t actually made it a point to add this to your client workflow that things can get hazy. If your welcome guide reads like a generic robotic template, chances are you need to do some adjusting! This point is two-fold for both the guide itself and the manner in which you send it. First, please for the love of all that is sparkly, write your welcome guide in YOUR voice. I’ve seen PDFs that remind me of the teacher in Peanuts. Your client hired you because they fell in love with YOU, not a generic cookie cutter version of someone else. If you purchase a welcome guide template, be sure to add your own personal touch and flair to the copy. Please and thank you. Second, please don’t mail your client JUST the welcome guide in a manilla envelope. There are so many inexpensive options to jazz things up a bit and add hints of your brand to your package. Side note: if you have put off creating a welcome guide due to concerns over the cost or the lack of time in your already full workday, you are in luck! Chances are you are reading this post because you are interested in or are already using Dubsado, am I right? Well, luckily for you Dubsado makes it nearly effortless to send a gorgeous guide to your clients. This handy little tool will actually save you the cost of printing and shipping all together.The best part? Automate it as part of your workflow!! Mind. Officially. Lauren is the Founder of Wedding Boss Life, a service-based brand that focuses on equipping wedding industry professionals with the tools needed to stop spinning their wheels and to streamline behind the scenes of their businesses. She is a Coach, Speaker, Educator, Author and Creative Innovator. Lauren is passionate about helping others start and grow sustainable businesses through a three-ingredient secret sauce: Setting Up Systems, Getting Found Online and Creating a Show-stopping Client Experience. With 10 years of entrepreneurship under her belt, she regularly contributes to publications such as the Rising Tide Society, Dubsado, and Showit. Lauren enjoys taking long walks down the aisles of Target in solitude, sneaks an occasional nap in when she’s not chasing her two sons, Liam (6) and Asher (4) and anxiously awaits her nightly glass of Malbec or Cab.